The beauty of Inner Harmony lies in the fact that we can be ourselves, to stand in our truth and to give the love and care that we so mildly and easily bestow onto others, to ourselves a bit too. Sometimes this is hard to do, we feel guilty, we feel fearful that we may hurt or disappoint someone, especially someone we care for. Yet, finding the balance between what is important, what is needed and what is compromise able, lead us to become more and more secure in ourselves, in acceptance of who we are and what is important to us and in so doing, we can ultimately recognise and understand that in someone else. The act of giving brings harmony. The beauty of Inner Harmony lies in the fact that we can respect ourselves, speak up and in so doing allow someone else to be able to do the same. To overcome their self-doubt and fears to stand up for who they truly are too. The act of understanding brings harmony. 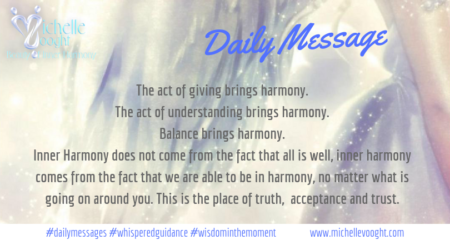 Inner Harmony does not come from the fact that all is well, inner harmony comes from the fact that we are able to be IN (within) harmony, no matter what is going on around you and in your world. This is the place of truth, acceptance and trust. Is it scary sometimes? Yes. Is it lonely sometimes? Yes. Is it powerful? Yes. Is it pure? Yes. Does it heal? Yes.